If you are looking for a great place to spend a few hours of your day, head to The Track Family Fun Park. The Track Family Fun Park offers a wide variety of activities that the entire family will enjoy. There are numerous locations along the Branson 76 Strip, each offering different attractions. At several of the locations you’ll find a favorite..go-karts! There are go-kart tracks for every age group. Heavy Metal High Rise, Wild Woody, and The Lumber Jack are three go-kart courses that are perfect for those seeking a more thrilling experience. Each of these tracks range from 3-4 stories and include spirals and hills. Classic go-kart tracks and tracks for smaller kids are also offered. Bumper boats and bumper cars are two other favorites! 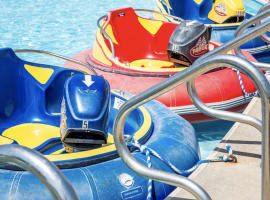 Hop on the bumper boats and prepare to cool off with the splashing and spraying of water from the other riders. Or, hop on a bumper car and enjoy a similar ride without getting wet! The kids will be sure to enjoy all that is offered at these parks. There are numerous kids rides including kid-sized tea cups, swings, ferris wheel, and a train. Other activities that the entire family will love include: batting cages, laser tag, laser maze, and mini golf! There are even arcades to check out, play some games, and win prizes! If you are really seeking adventure, head over the the skycoaster. Climb 100 feet before pulling the release cord and go flying around 70mph. For a memorable experience, make sure to ride the Branson Ferris wheel. Ride during the day to take in all of the sights of Branson. Or, ride at night to look at all of the amazing lights throughout the town. Catch the music and light show at various times each night and watch the Ferris Wheel light up! Be sure to check out all of what The Track Family Fun Parks have to offer! Click HERE to purchase a special “go-card” and spend the day having a great time making memories!